When we think of wine in the U.S., the names of grapes generally come to mind, such as Cabernet Sauvignon, Merlot or Chardonnay. In France, home to many of the grapes grown in the U.S., there is more of a geographical orientation with most wines being named for the region where the grapes are grown. Consider Bordeaux, one of the world’s oldest and most legendary wine producing regions, highlighted in magenta on the map. There are five Bordeaux grapes: Cabernet Sauvignon, Cabernet Franc, Merlot, Petit Verdot and Malbec. In France, a Bordeaux wine is usually a combination of the two or more of these five grapes. This blending practice is occasionally used in the U.S. as well: if you stick to only the five Bordeaux grapes and pay a fee to the Meritage Society, you can label your wine a Meritage. Which, when pronounced correctly, rhymes with “heritage”. More often, Bordeaux grapes are used in the U.S. to produce single varietals like Cabernet Sauvignon and Merlot. In practice, even if the wine label lists just one grape, it’s common to blend in something else for smoothness or character. Cabernet Sauvignon, for example, frequently contains a bit of Merlot or Cabernet Franc. Under the rules of the Bureau of Alcohol, Tobacco and Firearms, a bottle of wine can be called a varietal if it contains at least 75% of the grape listed on the label. If the primary grape constitutes less than 75% of the wine, you must call it a Meritage, a Red Blend or a Red Table Wine. 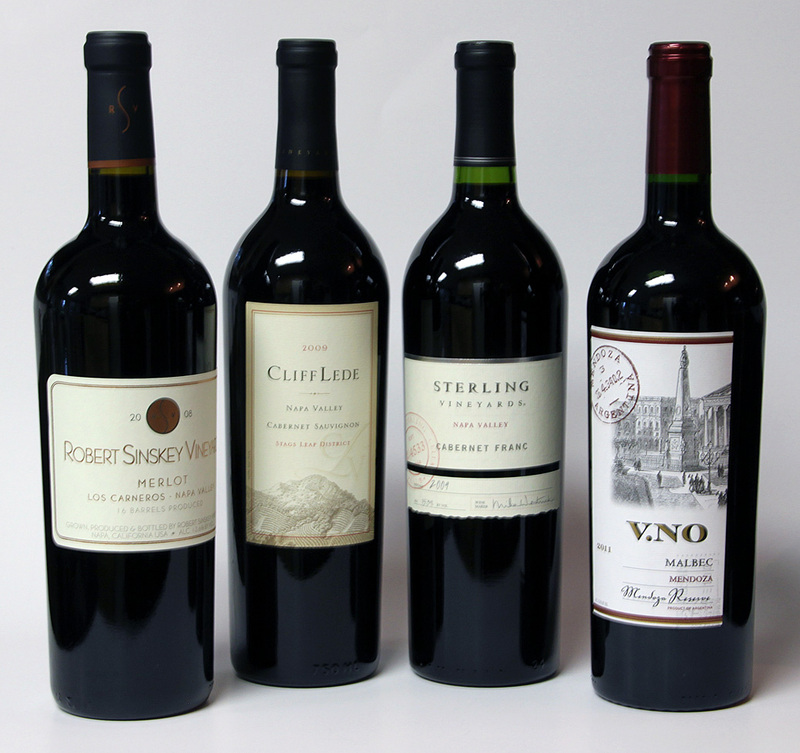 Pictured below are wines featuring four of the Bordeaux grapes: Merlot, Cabernet Sauvignon, Cabernet Franc, and Malbec. Not represented is Petit Verdot, which is rarely bottled as a single varietal, but instead is blended with other varietals to enhance the color and add tannins that improve aging. Of the four popular Bordeaux varietals, Cabernet Sauvignon gets the most respect. Most Cabs are big, complex wines made for drinkers with an evolved palate and they can command some of the highest prices in the wine world. If you win the lottery, consider seeking out a Screaming Eagle or a Colgin Cabernet. Think I’m joking? I recently saw a 2009 Screaming Eagle Cabernet Sauvignon listed at $2095. Not for a case, not for a Jeroboam, the seller is asking $2095 for a single 750 ml bottle. If that seems a little over the top, but you want a reliably great Cab for a special occasion, consider Silver Oak’s Alexander Valley Cabernet, Sebastiani Cherryblock or something from Napa’s Stags Leap District. Better yet, go French and try a Premier Cru like Chateau Margaux or Chateau Lafite. Merlot, on the other hand, has a reputation among critics for being a “beginner’s wine” with many producers avoiding bold flavors and tannins that might be off putting to someone unaccustomed to red wine. Paul Giamatti’s rant about his disdain for Merlot in the film Sideways didn’t help the grapes reputation, either. But in some cases, this reputation of mediocrity is undeserved. The Robert Sinskey Carneros Merlot seen in the photo is a fabulous wine, with complex flavors, a great balance and a beautiful finish. Malbec has become popular in the U.S. in recent years, mostly owing to a dearth of excellent and affordable imports from the Mendoza region of Argentina. Cabernet Franc, like Petit Verdot, appears more often in blends than as a single varietal, but if you see a Cab Franc on the tasting menu at a winery give it go; it can be a real treat. Stay tuned for our next post where we explore the wines of Burgundy. It’s November. On the California coast that means two things: the start of the winter rain and crab season. 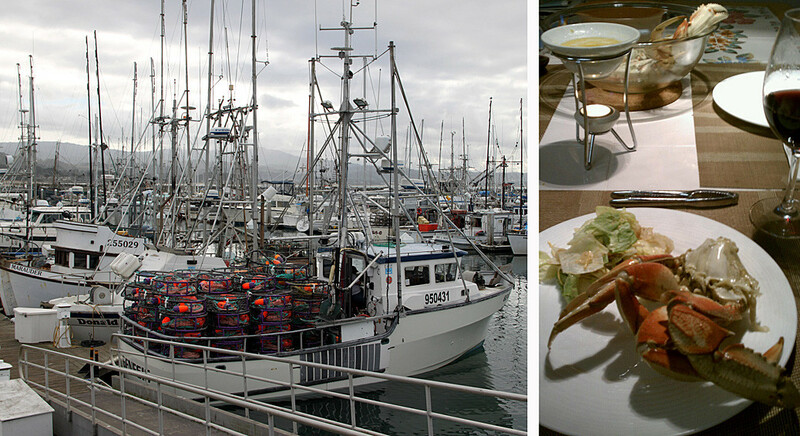 This time of year the Pacific Coast and the San Francisco Bay are teaming with fresh Dungeness crab, the sweetest seafood on Earth. And what better way to start crab season than a trip to Half Moon Bay, where nearly every fishing boat in the harbor is loaded with crab traps. 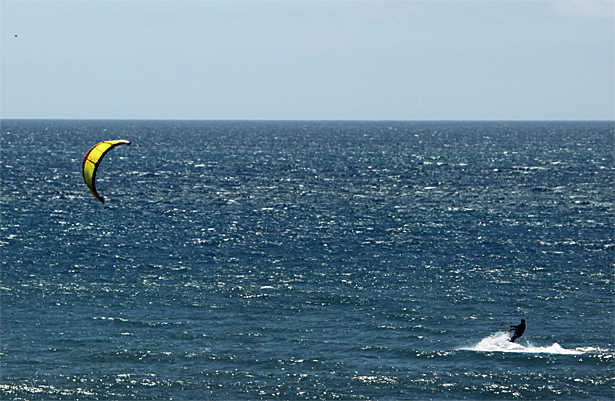 The drive up the coast to Half Moon Bay is gorgeous, with breaking waves, dramatic cliffs and blue waters dotted with kite surfers. First stop is Davenport, for brunch at the Whale City Bakery. A few doors down is the Bonny Doon Winery tasting room, but let’s save that, and colorful owner Randall Graham, for another column. Instead, we headed further up the coast and made a quick jog inland to visit Pescadero, home of Santa Arcangeli Winery. The tasting room is modest, but the Santa Cruz Mountain wines are delectable. Be sure to try the Chardonnays and Pinot Noirs. And don’t leave town without a stop at the vintage Pescadero Country Store for some fresh artichoke bread. Continuing north on Highway 1, we soon reached our destination. 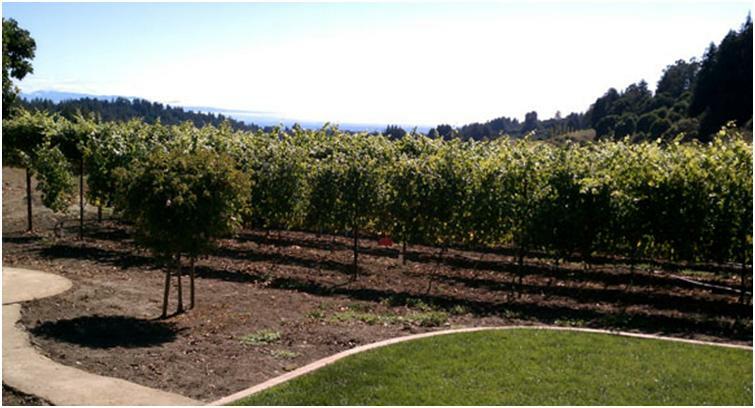 Half Moon Bay is home to just two wineries, La Nebbia and Barterra. La Nebbia is a few miles inland on Highway 91, surrounded by excellent nurseries. 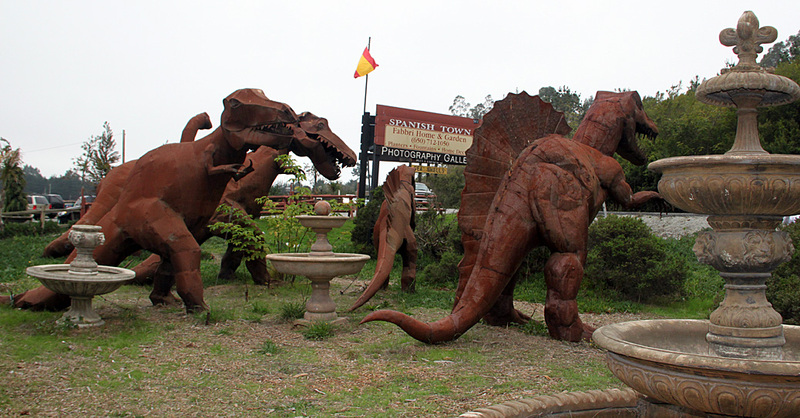 Also on 91 is Spanish Town, which features a collection of life sized steel dinosaurs and a vast collection of statuary. If you’re short of time, I’d recommend stopping at Spanish Town and skipping La Nebbia altogether. Either way, be prepared to make a dangerous left turn back onto Highway 91. Barterra Winery is in downtown Half Moon Bay on Main Street, situated among boutique shops and fine restaurants. Be sure to park the car and walk around. The day we visited Barterra the tasting room was staffed by owner Mary Colucci and her winemaker husband Bart, a charming elderly couple who have probably forgotten more about wine than most of us will ever know. 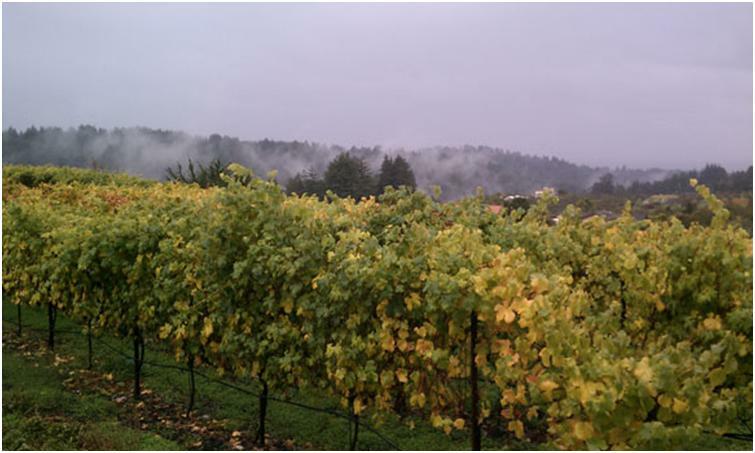 Their 2012 Sonoma Coast Pinot won a double gold medal at the San Francisco Chronical Wine Competition, as did their 2009 Delmar Vineyard Alexander Valley Cabernet. Be forewarned: you might like the Cab enough to pay the $125 list price. Half Moon Bay is host to many beautiful waterfront hotels. If you’re feeling flush, try the Ritz Carlton situated on a cliff top with views to die for (which you may well do when see your credit card bill). For anyone on a budget (or saving up for the fabulous Barterra Cab), I recommend the Beach House, Oceano, or the Inn at Mavericks. 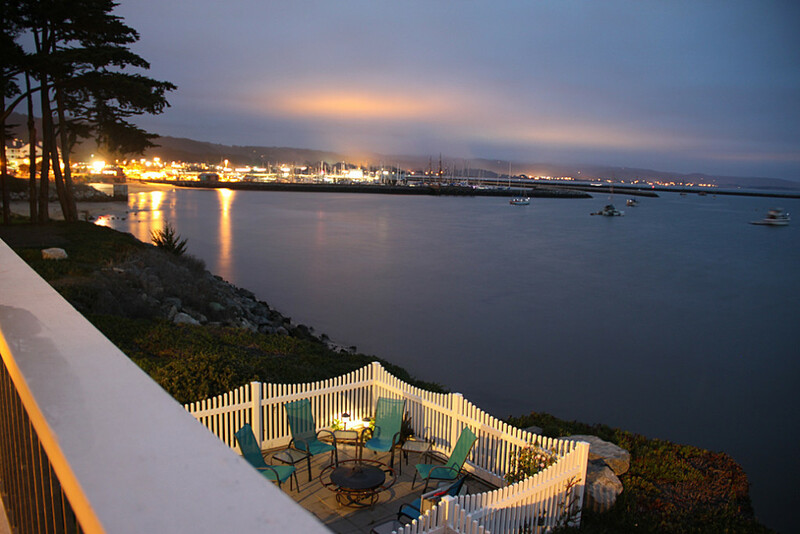 All have ocean and harbor views and are walking distance from excellent dining. We opted for the Inn at Maverick’s, a cozy six room inn named after the world famous surfing spot located nearby. Bring your camera: the views are astounding. Within a short walk is Mezzaluna, an Italian restaurant frequented by locals. Just a block further, at the harbor is the Half Moon Bay Brewing Company, voted one of America’s best beach bars. I recommend the Princeton-by-the-Sea IPA or the Maverick’s Big Break Ale. Better yet, have a flight and see what you like best. And the Cochinita Pibil sliders are crazy good. Cochinita Pibil is a close cousin to carnitas, my favorite thing to make with pork shoulder. The seasonings are similar (citrus, cumin and chili peppers), but Cochinita is lightly smoked then slow roasted in a banana leaf. And don’t leave town without a stop at Sam’s Chowder House for some clam chowder or a fresh shrimp and Dungeness Louie salad (be sure to go early or make a reservation). I’m ready to go back already. If you’ve ordered wine in a fine restaurant, you may have interacted with the resident sommelier. In addition to employing their vast knowledge of all things wine to help their customers choose a great wine for the occasion, sommeliers typically hand pick the wine menu for the restaurant, manage the cellar and train the wait staff on wine related matters. Only recently have they begun to share the same status as celebrity chefs. Becoming a sommelier is a serious undertaking. Structurally, it is similar to many trades where you attend school then take a certification exam for each level of expertise. It is generally accepted that there are four levels of sommelier-dom: Introductory, Certified, Advanced and Master. At every level, students are instructed and tested in three categories: wine theory, tasting, and service. You must exhaustively study the history of wine, and you must to be able to identify by smell and taste any wine’s varietal and country of origin. And the service part: you must be able to defuse difficult customers. The Master certification is governed worldwide by the Court of Master Sommeliers, while the lower three levels are governed by different organizations depending on country. In the U.S., sommelier certification is provided by the North American Sommelier Association. Yes, their initials spell NASA. Is it just a coincidence that the Culinary Institute of America has the initials CIA? What is it about food and beverage organizations sharing government acronyms? 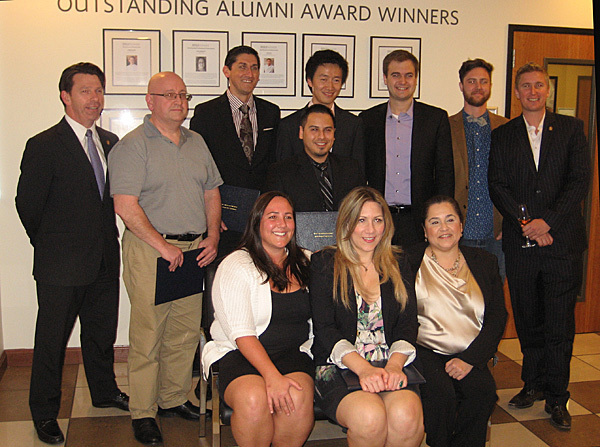 Pictured below is the 2014 graduating sommelier class from the International Culinary Center in Silicon Valley. These students have two weeks after graduation to prepare for the Certified Sommelier Exam. If you enjoy wine themed movies, then you might recognize instructor Ian Cauble on the far right. Cauble starred in the documentary film Somm, which tells the story of a group of young people preparing for the grueling Master Sommelier exam, which Forbes Magazine termed “the world’s toughest test”. Cauble and Alan Murray (far left) are among the elite group of just 214 Master Sommeliers in existence. Even though Australia has many renowned wineries, Murray is the only Aussie to become a Master Sommelier. The film Somm is well worth watching if you have any interest in wine. It’s beautifully photographed, informative and suspenseful and the scenes are separated by entertaining shots of wine glasses being destroyed in creative ways. You’ll be amazed at not only the vast knowledge of professional sommeliers, but their ability to recognize and describe every nuance of the aroma and flavor of a glass of wine. In one scene, one the students insists that the varietals in his blind tasting are out of order. The Master Sommelier Instructor merely smells the wine in the one of the glasses and states with authority “they are in the correct order”. It is a noble, challenging and rewarding profession that was brought to my attention when I attended the Somm film premier at the Del Mar Theater in Santa Cruz. 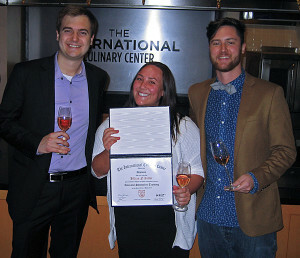 Now all things sommelier have been brought closer to home; my stepdaughter Jillian Ritter is one of the aforementioned International Culinary Center graduates (pictured at right at graduation with two classmates). Stay tuned for an upcoming trip to one of the oldest wine growing regions of California, the Livermore Valley. As the Super Bowl approaches I find myself thinking of the “Rotation”, the three locales where most Super Bowls are played. Miami, New Orleans and Southern California have mild winter weather, excellent accommodations and each is a popular place to visit. But for variety, the NFL sometimes chooses to host the game somewhere else entirely: like New Jersey. If my weekend getaway wine tasting rotation is Napa, Sonoma, and Paso Robles then what’s my New Jersey? 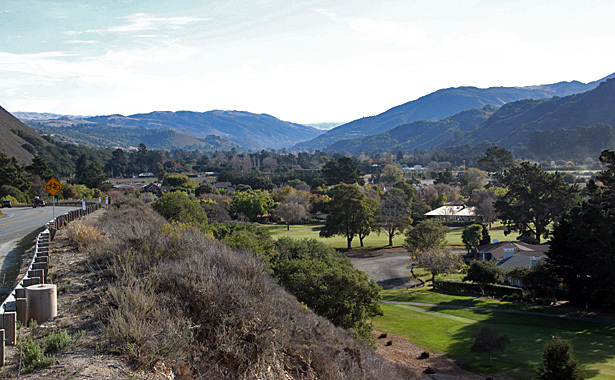 I’m still not sure, but my Tampa (host to four Super Bowls) is Carmel Valley. It is uncharacteristically sunny for being so close to notoriously foggy Monterey, has several great places to stay, and is always fun to visit. This coastal valley is also a scenic gem. 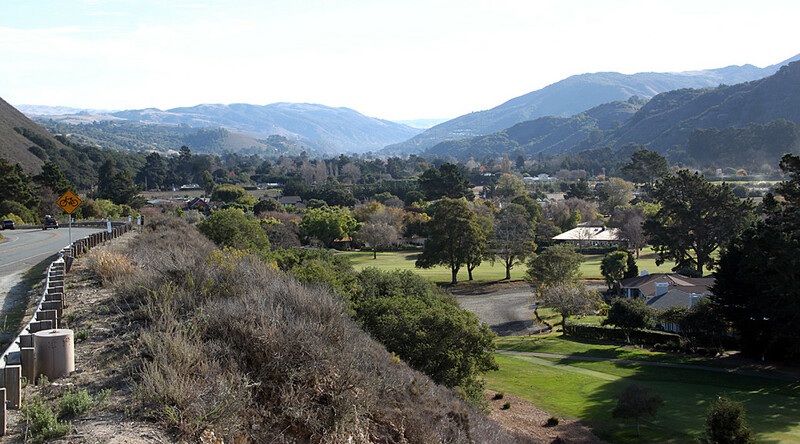 Carmel Valley Village, located about six miles from Highway 1, is now home to more than 30 tasting rooms. My favorite first stop is Bernardus. The building is not fancy and the tasting room, while of decent size, has a low ceiling and casual ambience. Belly up to the bar and you will invariably be greeted by a knowledgeable, gregarious and generous pour person. Bernardus crafts fine single vineyard Pinot Noirs and Chardonnays from the best local vineyards, including Rosella’s, Sierra Mar, Ingrid’s, Tondre, Garys’ and Pisoni. (Would you like one Gary or two with that?). But don’t be distracted by Bernardus’ focus on Pinot and Chardonnay; if they offer you a taste of a Cabernet, or their estate grown flagship, a red blend called Marinus, do yourself a favor and kindly accept. We’ve had the great fortune of trying many stately Napa cabs, but my wife considers the Bernardus Ocean Block Cabernet to be the best she’s ever tasted. Many of the grapes used at Bernardus are grown in the nearby Santa Lucia Highlands, but Ingrid’s Vineyard is in the valley, surrounding Bernardus Lodge. If you’re looking for a top end place to stay in the valley, Bernardus Lodge, located about two miles from the village, is highly recommended. If you’re on a budget, watch for the specials at Quail Lodge where you can secure excellent accommodations at bargain prices. Bring your putter if you do; the lodge has many excellent putting greens located on the lush grounds that surround the lodge. Or bring all your sticks and take in 18 holes right on the property. If you get hungry, you won’t regret walking across the street to Baja Cantina and Grill, where you can enjoy excellent, original Mexican recipes and refreshments. Monday night is my favorite when they specialize in American style barbeque. A visit to Carmel Valley Village wouldn’t be complete without stopping in at Talbott Vineyards on Pilot Road, just off Carmel Valley Road. 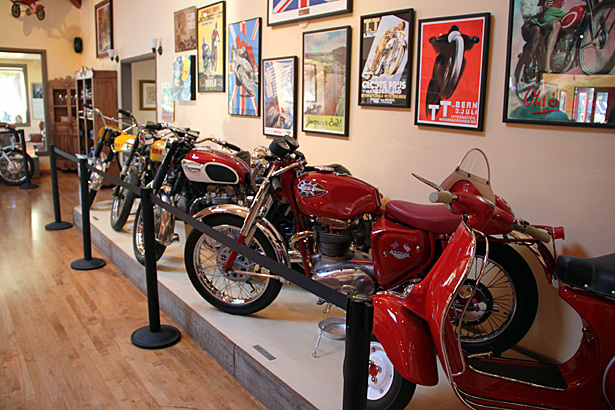 The first thing you’ll notice when you enter is owner Robb Talbott’s motorcycle collection. Restoring classic bikes is one of Talbott’s many pursuits. Another is growing amazing grapes, both at his Sleepy Hollow Vineyard in the Santa Lucia Highlands and Diamond T on a mountaintop near Carmel Valley. 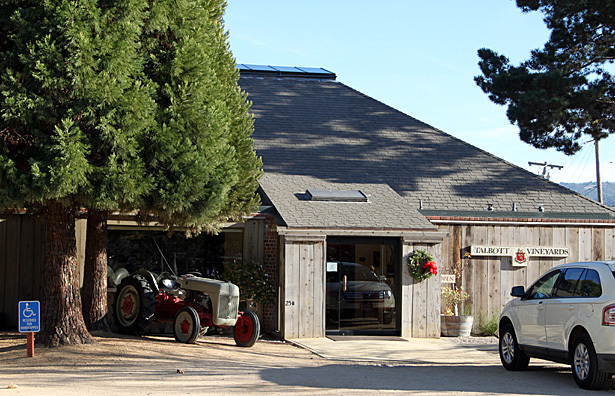 Like Bernardus, Talbott primarily features locally grown Pinots and Chardonnays. The selection and quality is outstanding and I was impressed by our pour person’s breadth of knowledge. Talbott wines are fairly widely distributed, so you might be able to find a Kali Hart or Logan Pinot or Chardonnay at a store near you. If not, you’ll just have to visit. When people refer to California Wine Country, they usually mean the many fine wine grape growing appellations of Napa and Sonoma counties: Stag’s Leap, Oak Knoll, Howell Mountain, Alexander Valley, Russian River and many more. Only one growing region spans the two famed counties: Los Carneros. In fact, it’s hard to get to Sonoma or Napa without passing through Los Carneros: on the east side Napa is just to the north, and the west side Sonoma is to the north. 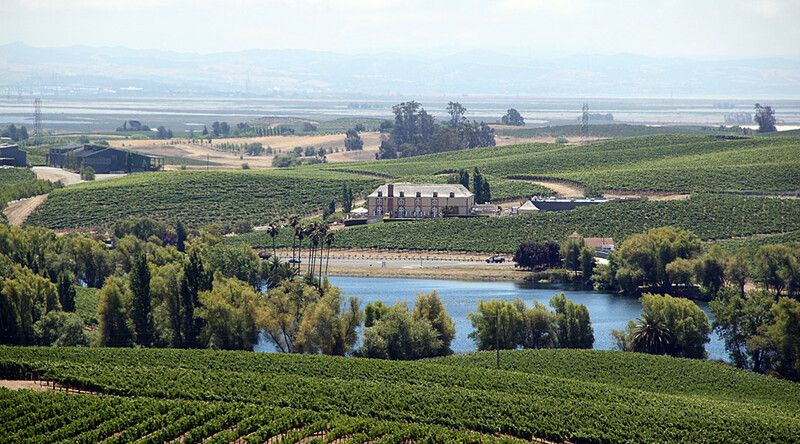 Los Carneros is bordered by the San Pablo Bay on the south, which provides the same maritime climate influence that helps grow great Chardonnay and Pinot Noir grapes, much like the Monterey Bay and the Santa Ynez Valley. If you head to Sonoma via San Francisco and the Golden Gate Bridge, taking the 101 Freeway to Highway 37, you’ll find two of my favorite West Carneros wineries: Gloria Ferrer and Cline Cellars. Gloria Ferrer is a stately complex, built on a hill and accessed by a long staircase leading up from the parking lot. The view from the deck justifies the effort you’ll put into the climb. Gloria and her husband José knock out some excellent and relatively affordable Chardonnay, Pinot, and sparkling wines (that’s Champagne to you, but if I say it I’ll get in trouble with the French). Gloria doesn’t do a traditional “line up the bottles” tasting, instead providing à la carte wait service on the deck and a complementary glass of bubbly. I usually opt for the flight of Pinot and am never disappointed by the view, the service or the wine. 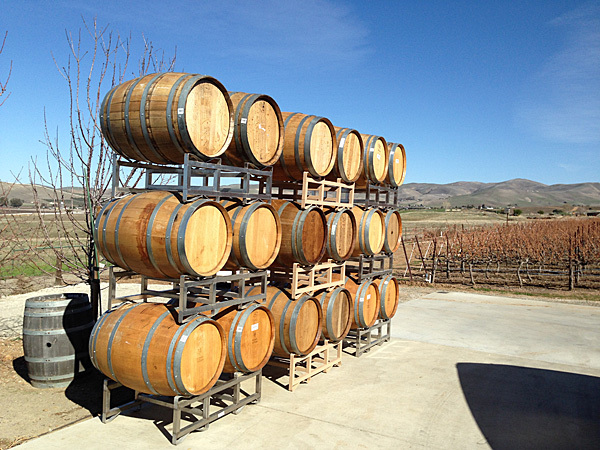 On the north side of Highway 37 you’ll find Cline Cellars, a small, low key operation specializing in Rhone varietals like Mourvèdre, Roussanne and Carignane as well as more popular wines like Zinfandel, Syrah, Viognier and a cool climate Pinot Noir. 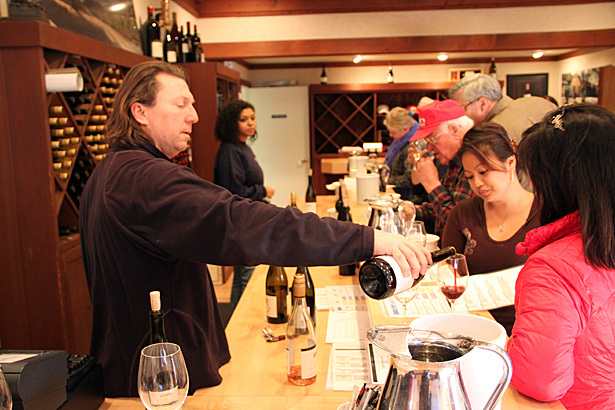 The tasting room staff at Cline is always friendly, generous and knowledgeable. The tasting room is in an old farmhouse with a wraparound porch and not a hint of pretense. Out back you’ll find a large pond stocked with fish and turtles. It’s a great location for a picnic, so bring some sandwiches. Like many family wineries, Cline keeps an old truck parked out front, in this case a red one. Years ago Cline started a second label which uses this same red truck as its namesake and label art. You can still buy Red Truck wine just about anywhere, but Cline sold the brand after it grew into a much bigger business than they wish to run. The truck is still there. If you’re heading to Napa, a popular approach is to take the 880 through the East Bay until it merges into Interstate 80 near Oakland. Be sure to take 80 East, even though the signs say Sacramento. 80 West would take you over the Bay Bridge into San Francisco. The views are astounding as you cross the San Francisco Bay and approach the city, but save that for an actual visit to SF. Continuing on 80 East takes you past Berkeley and on to Highway 37 at Vallejo, home to a Six Flags amusement park with massive steel rollercoasters and a zoo. This is the same 37 that you take on the East side to get to Sonoma. It traverses all of Los Carneros, and thus ends our geography lesson for today. A great choice for a Napa trip is a visit to the aptly named Artesa. The building lies atop a high hill with stunning views and magnificent artwork, inside and out.To conserve energy and blend in with the surroundings, the entire building is buried underground save a couple corners peeking out of the hillside. Be sure to bring a camera so you can show the sculptures and views to the folks back home. The wine and service at Artesa were great and we felt unrushed in the spacious tasting room and adjoining deck despite the brisk business that takes place on a typical weekend. Wishing to juxtapose the somewhat over-the-top experience that is Artesa, we decided to seek out something low key. My wife had heard good things about Saintsbury, so we looked them up from the parking lot. Smartphones and Google Maps can really be handy on a wine adventure. Saintsbury’s website said they were open by appointment only, so we opted to be sophomoric and call for an appointment in five minutes. They were gracious and accommodating. Saintsbury specializes in the Chardonnays and Pinot Noirs one would expect from the Carneros terroir and they get everything right. There is no tasting room or bar; you can choose to be served at a table under the trees or you can congregate on the rustic porch. 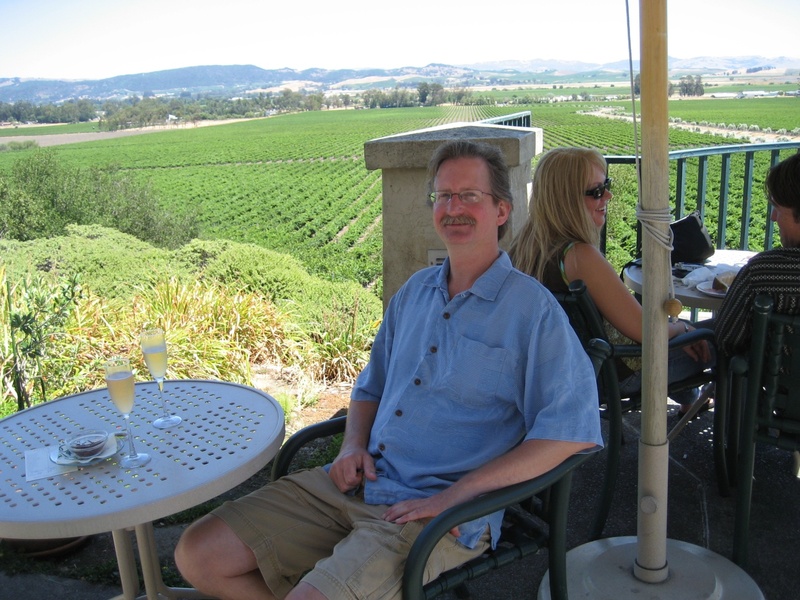 There is no wrong choice; we chose the tables and while there were no commanding views of Los Carneros or the San Pablo Bay, we did get to watch the winemakers bottling. It’s always a treat to mix the grandiose with the nonchalant. Wine adventures are as much about the ambiance of the places you visit and the stories of the people you meet as they are about trying new wines. Thanks for tagging along with us on another trip. I’ve driven the 101 Freeway to Southern California countless times while visiting friends, taking business trips, and as a student at UC Santa Barbara. 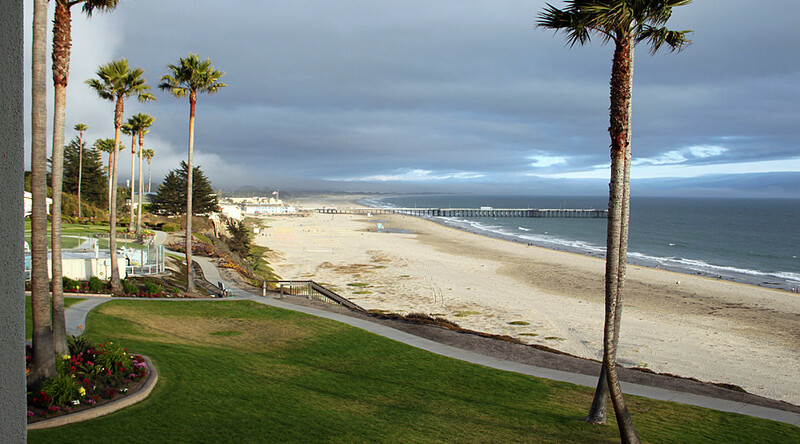 Every time I passed Pismo Beach I promised myself to one day stop and check it out – maybe even spend the night at one of the many beachfront hotels. Last June we were on our way back from a Sideways tour and decided to take the plunge. But not before visiting another Highway 101 landmark, Laetitia Vineyards. I’ve been a fan of their excellent Arroyo Grande Pinot Noir for years and was determined to see the place and try their best stuff. This particular weekend proved fortuitous as we arrived to find the scenic estate festooned for a wine club event. Since my wife works in the industry, they welcomed us to come in, have a look around, and try everything. I am now aware that in addition to the expected high caliber Pinots and Chardonnays, Laetitia makes outstanding Cabernet. Bravo! Wineries are always looking for ways to keep the barrel room at the perfect temperature so the wines can age properly without sending all the profit margin to the local electric and gas utility. Many use caves, but if you examine the photo below left, you may notice that the production facility is buried. Be careful parking or you could end up on the roof. On the right is a large hydraulic grape press, many years old but still operational. As a motion control guy, I’m always on the lookout for anything that moves. The drive from Laetitia to Pismo Beach is short and scenic. We arrived just past noon and headed toward the wharf, snagging the first available parking spot. Pismo on a summer weekend can be crowded and touristy, which helps explain why I had never stopped before. But this day we were determined to wait in line at the Splash Café as long as necessary for a bowl of their legendary clam chowder. Splash is located at a busy intersection near the wharf where most passersby are on foot, bicycle, motorcycle or leash. The awesome people watching and photo ops made the 45 minute wait go fast. If it hadn’t, it still would have been worth it. I’ve been a chowder head since childhood and I even like to think mine’s pretty good (secret ingredient: homemade Dungeness crab stock) but I’ve had nothing to rival Splash Café. The Kon Tiki has a restaurant called Steamers with the same commanding view of the Pacific you enjoy from your room, but by evening we were looking for an excuse to take a walk through some of Pismo’s many charming neighborhoods and soon found ourselves at The Cracked Crab on Price Street. Wow. They have great service, amazing fresh seafood and a nice wine selection. And the wall art includes beach themed watercolors by UCSB art professor Hank Pitcher. By strange coincidence, so does my man cave. After a wonderful day and night in Pismo, we drove north to Paso Robles. We’ve been to Paso many times searching out wineries new and old and usually make our base of operations one of the hotels near the intersection of the 101 Freeway and Highway 46. This time we were meeting friends and opted to lodge in downtown Paso at the historic Paso Robles Inn, where you can park the car and walk. The Paso Robles Inn sits at one end of a downtown park that’s surrounded by half a dozen tasting rooms, plus restaurants, shops and a movie theater. The tree lined streets and vintage brick buildings provide an excellent backdrop for a casual adventure. 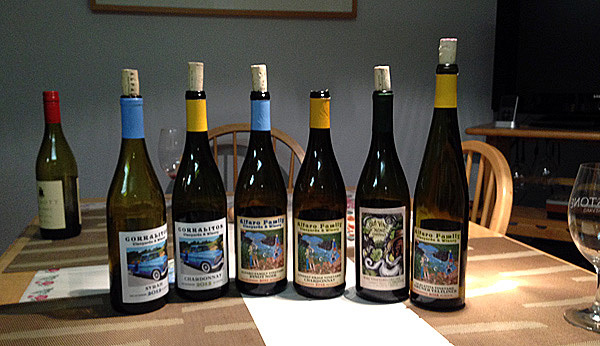 Of the many tasting rooms, I found Parrish Family Vineyard to be the standout. The tasting staff was knowledgeable and entertaining, Parrish produces excellent fruit forward wines, and they do a wine and cheese pairing featuring boutique cheeses from local Paso favorite Vivant Fine Cheese. Thanks for joining us on another wine adventure. Next time we’ll visit the legendary Los Carneros appellation. If you are a California wine aficionado, you may have been tempted to recreate some of Jack and Miles’ adventures from Sideways, the film about two bachelors having a last romp in Central California wine country before one of them gets married. I’m already married, so my recent Sideways tour did not include a naked tow truck driver nor Sandra Oh in any compromising positions. Nonetheless, we managed to have a great time and enjoy some wonderful wine and food. The keys to a successful Sideways recreation are: an aspiring writer (check), a love of Pinot Noir (check) and a motel room to serve as home base (check). In our case, the motel was in the lovely Danish village of Solvang, located near the 101 freeway at the southern end of the Santa Ynez Valley. 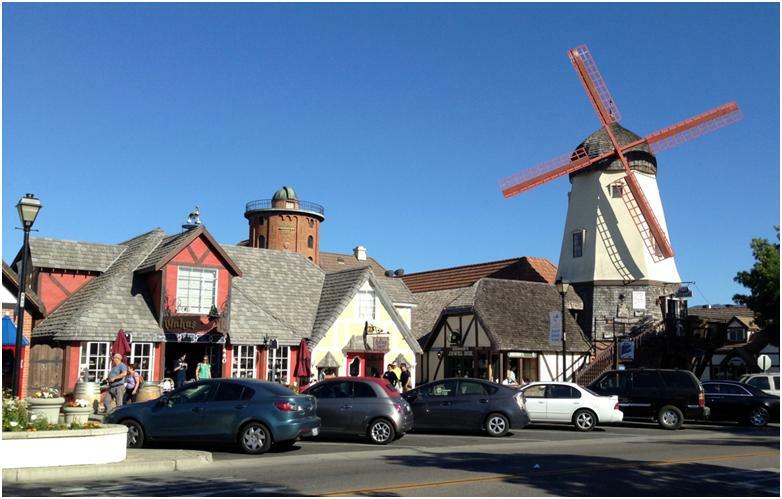 Solvang is a fun town to explore on foot, with block after block of Danish architecture, excellent bakeries, decent restaurants, numerous gift shops and a good brew pub. Most of the architecture in California is either Spanish colonial, midcentury modern or ranch house; sometimes you get an urge to see something completely different, and Solvang is all that. It also features a handful of tasting rooms. We found the Las Vegas themed Sort This Out Cellars to be a fun respite from the faux-Danish kitsch. They also feature an Elvira series, styled for the horror film hostess. The 2008 Elvira Macabrenet was good enough to bring a bottle home for Halloween. 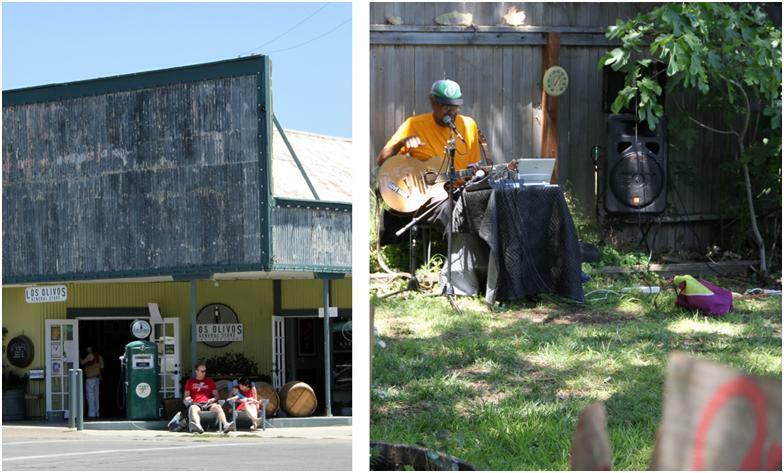 To find the truly great wines of the Santa Ynez Valley, head north out of Solvang on Alamo Pintado Road, past the miniature horse ranch, to Los Olivos, a quiet little town where you can see folks kicking back in front of the General Store and be serenaded by a backyard musician. If you’re hungry, you can get a great burger at Sides Hardware and Shoes. Or you can taste wine next door at Presqu’ile and have them bring over the burger. There are more than fifty tasting rooms in Los Olivos, most within a couple blocks of the General Store, so park the car and walk. I’d recommend lunch and a couple tastings in Los Olivos, followed by a drive northeast on Foxen Canyon Road. 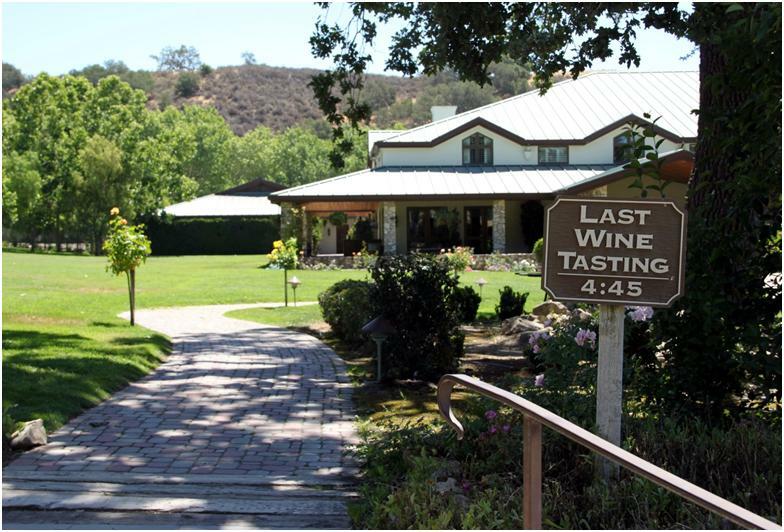 There you will find not just tasting rooms, but actual wineries, including some of my favorites. 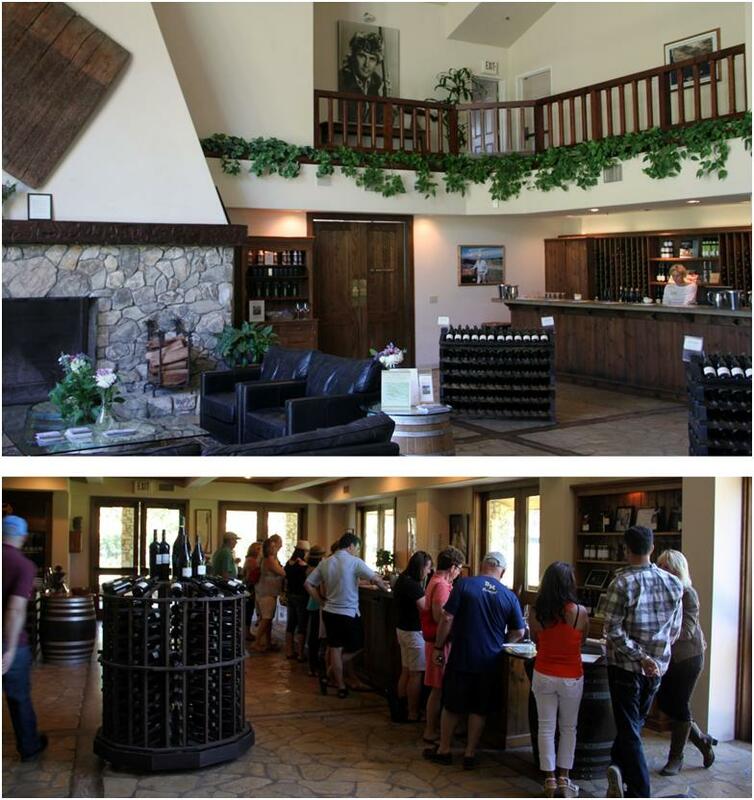 Koehler is an excellent first stop, with gorgeous vineyards, quality estate wines and a fun tasting room staff. Koehler makes a tasty Santa Rita Hills Pinot, excellent full bodied cabs, and a nice estate Sangiovese. The “star” of Foxen Canyon is Fess Parker. For those too young to know, Parker was the star of TV’s Davy Crocket where he played the legendary frontiersman. He later made a fortune in the hospitality and wine industries of the Santa Barbara area. Not surprisingly, his winery resembles a modern version of the frontier cabins that made Parker famous. 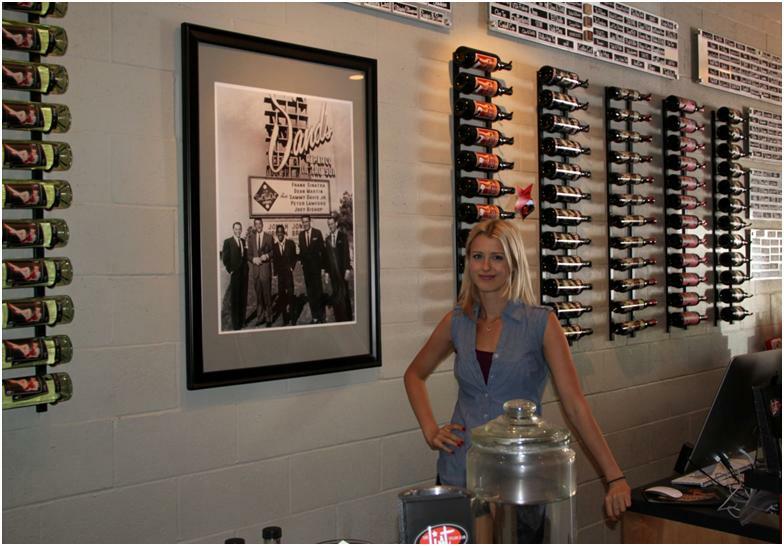 The grounds and the tasting room are spacious and comfortable, and the staff is first rate. Parker’s son Eli is the head winemaker and takes full advantage of the local climate’s ability to produce extraordinary Chardonnay and Pinot Noir fruit. In addition to the many great estate wines, Parker produces a Bien Nacido Vineyard Pinot that is everything a great wine should be. Are my eyes deceiving me, or did someone plant a bottle of Alfaro Family wine in the tasting room display? Who would perform such a sophomoric stunt? Well, it was a Sideways tour, and we were at Fess Parker, so a little horseplay might have seemed appropriate. Thanks for joining us on another wine adventure. Next time we’ll visit Paso Robles and Pismo Beach. Let’s say you’ve followed the sage advice of these columns, visited one of the many fine wineries featured herein and brought home a bottle of something special. Now what? First, you need to get the bottle open. While a few reputable wineries are using screw caps, most good wines still require a corkscrew. My favorite is the classic stainless steel waiter’s corkscrew, also known as a wine key, shown at the bottom of the photo. It’s an effective and long lasting tool, with a sharp, durable screw and a fold out blade for foil cutting. It’s also lightweight and compact enough for travel. Because the blade is less than six centimeters long, it qualifies under the newly proposed TSA rules for carryon baggage. 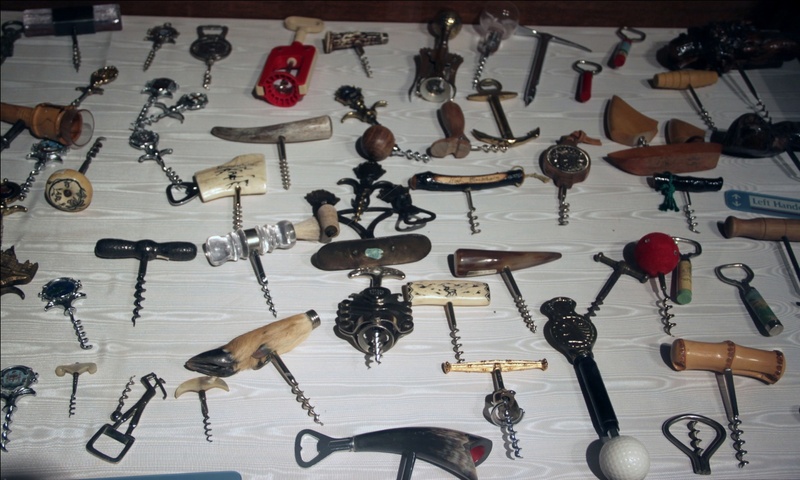 The TSA used to confiscate corkscrews at security checkpoints, which were later sold in small lots on eBay. My wife has exploited this situation to acquire a fine collection. 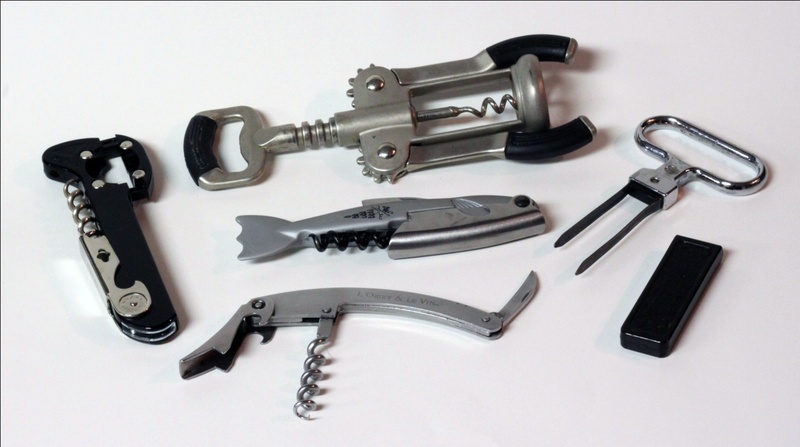 The shark-shaped corkscrew in the middle was liberated from a passenger returning from the Georgia Aquarium: the dorsal fin swings out to serve as a foil cutter. Feel free to hum the theme from Jaws while you open a bottle; we all know about the bond between wine and cinema. On the left is another wine key, this one with a safer and more convenient foil cutter. This is the style preferred by many tasting room associates (aka “pour people”), who open many more bottles than us mortals. Featured at the top of the photo is the “winged corkscrew” with two levers, or “wings” that extend as the screw is driven into the cork. This device is a bit bulky, but useful for anyone who doesn’t have the hand and wrist strength to wield a traditional wine key. The built-in beer bottle opener is a plus, but most “waiter style” keys can also remove bottle caps. We complete our tour of openers with the ah-so, the device on the right with two thin, rigid steel blades that are designed to slide down opposite sides of the cork. With a gentle twist and pull, the cork is free and unharmed. The ah-so is highly recommended for older bottles of wine whose corks may disintegrate when a screw is driven down their center. The ah-so does require a bit of practice, lest the prongs simply force the cork further into the bottle. If you want to see a vast collection of wine openers, pay a visit to the Culinary Institute of America in Napa Valley. Shown below is a sampling of their enormous display. Now that we’ve mastered the task of bottle opening, we’ll need something to drink from. Shown below are four wine glasses from Riedel, the venerable German glass maker. In a tasting room you would invariably start on the left with a white wine, but I’m going to break with convention. The style of glass is more important to the enjoyment of big red wines, so we’ll start on the right with a glass “optimized by German engineering” for Burgundian wines (think Pinot Noir). 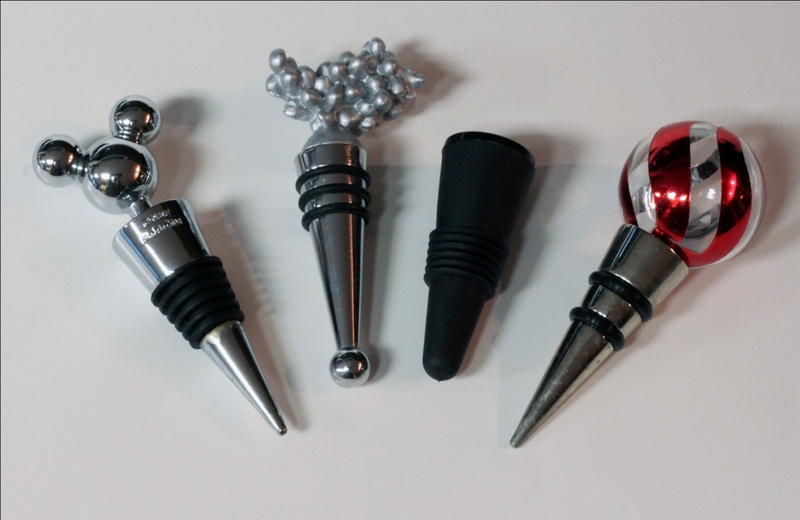 The shape is designed to direct the wine to the part of your tongue featuring the optimal taste buds for the enjoyment of Pinot. (I am not making this up!) Should we call it The Ultimate Drinking Machine? This glass allows your nose to get into the bowl where you can fully enjoy the tremendous “nose” that accompanies a good red. It also allows the wine to breathe better so that you can enjoy every nuance of its complexity sooner, making a good red wine more enjoyable. Next to the Burgundian is the Riedel Bordeaux (that’s Cabernet and Merlot to you and me). This is another fine glass worthy of investment, but if you’re on a budget you don’t need the Burgundian and the Bordeaux; either will suffice. The glass to the left of the Bordeaux is made for Chardonnay, directing the wine to a different area of your tongue. Whites don’t taste any better to me in this glass than they do in the ”giveaway” winery logo glasses, so unless you’re entertaining the boss or your rich uncle, you might want to skip the deluxe Chardonnay stemware. 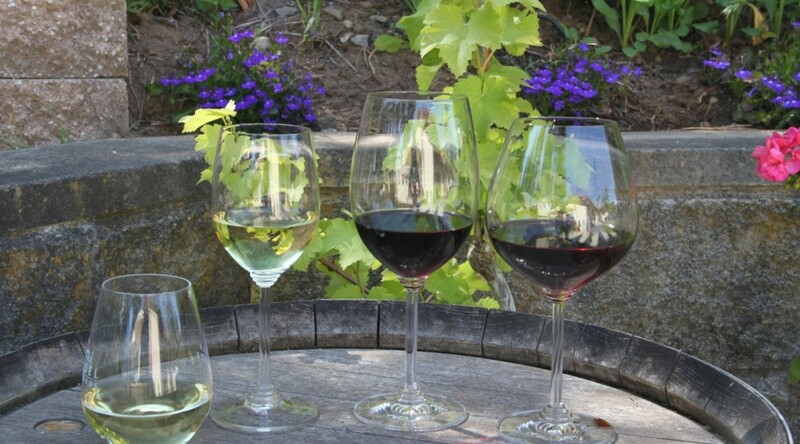 The leftmost glass is a stemless style intended for whites. It’s compact, modern and less likely to be knocked over. There is also a stemless red version, but the bowl is so large as to be difficult to grip for non-NBA stars. If you don’t finish your bottle, you’ll likely want to save it for the next day. If the cork didn’t expand too much when it came out of the bottle, you can always shove it back in. The boss will be impressed. Or you can use this opportunity to purchase yet more gadgetry for your favorite hobby. Stoppers come in so many shapes and sizes that there is surely one for every occasion and taste. Shown below is a sampling of our collection. My personal favorite: the black one second from the right. It seals nicely, is easy to clean and is compact enough at I don’t fear running out of headroom when putting an open bottle of Chardonnay back in the fridge. If you’re wondering where to purchase a good corkscrew or other tool of the trade (other than eBay) I recommend Wine Enthusiast for internet sales, or a BevMo retail store. 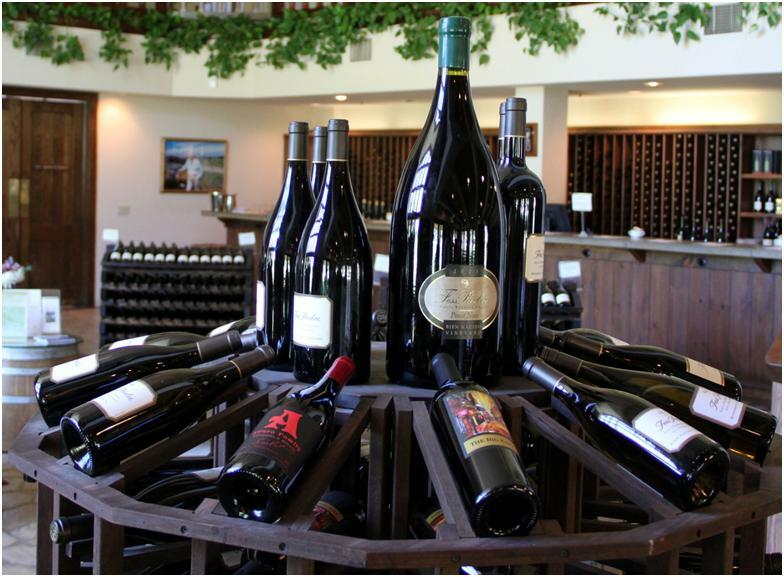 Winery gift shops often have nice items as well that can double as a souvenirs of your trip. Just check with the TSA before heading through security or my wife may end up with your new corkscrew. Next month we’re vacationing in Paso Robles, Pismo Beach and the Santa Ynez Valley, so please check back for more wine fun. 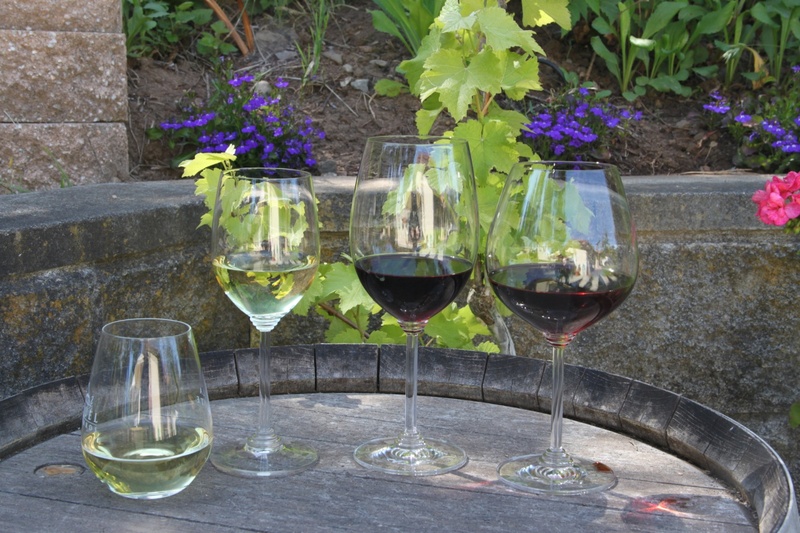 If you’re not busy on a weekend afternoon and feel like taking a drive into the Santa Cruz Mountains, Soquel Vineyards is a great destination. They’re above Soquel Village, on Glen Haven Road next to Camp Kennolyn, and were founded by twin brothers Peter and Paul Bargetto and their friend Jon Morgan. The Bargetto name has long been synonymous with winemaking in the Santa Cruz area. The estate is about ten minutes from Soquel Village and it’s a leisurely drive. I think you’ll find that the Chardonnay and Pinot Noir are worth the drive alone, but if that doesn’t do it for you the views are sure to amaze whether you have a clear view of the Monterey Bay or the romantic visage of fog slowly rolling up the hill. One of the stars of the tasting menu is the Partner’s Reserve Pinot, which is a blend of 16 clones from four vineyards. 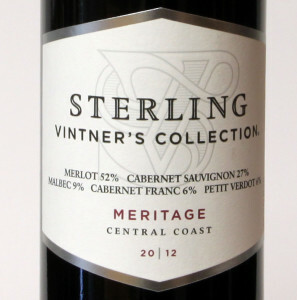 The 2010 vintage of this magnificent wine won the gold medal in the San Francisco Chronicle Wine Competition. Soquel Vineyards also makes a superbly nuanced Lester Pinot; regular readers know my fondness for the Lester fruit. I also love cabs, and the Bald Mountain Cabernet Sauvignon does not disappoint. Being of Italian heritage (Peter speaks the language fluently and often visits “the old country”) the brothers always have some Sangiovese on hand. 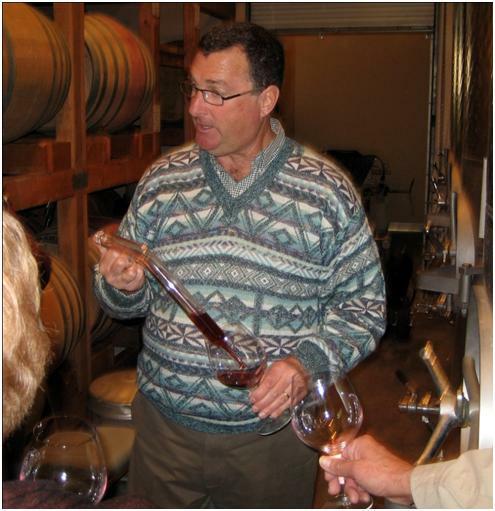 Peter might even be coaxed into offering you a barrel sample, while answering any questions you have about the winemaking process. The boys don’t get to have all the winemaking fun at Soquel, as they are joined by talented and adorkable assistant winemaker Olivia Tuetschel, also a frequent presence in the tasting room. 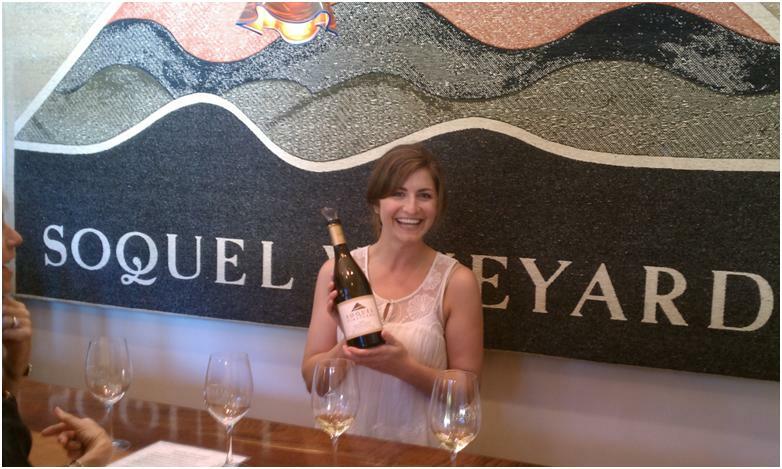 Chardonnays are a specialty at Soquel Vineyards and O’s Chardonnay, made by Olivia, is a great one. I was lucky enough to participate in the “Boy’s versus Girl’s Chardonnay Taste Off” in the barrel room when the wines were just about ready for bottling and I can conclusively state that all the winemakers are on top of their game at Soquel. Like every Italian-American family I know, the Bargetto’s love cooking. 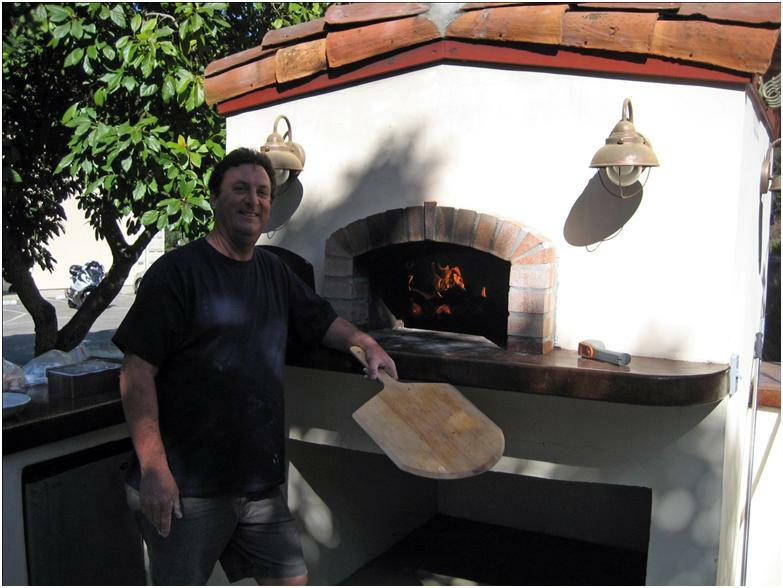 I can remember falling in love with this place the first time I visited, as no sooner had I taken my first taste of delicious Santa Cruz Mountains Chardonnay than Paul Bargetto approached with wood fired pizza, hot out of the oven. Paul is always experimenting with the pizza recipes, so visiting can be a new experience every time. And the cuisine isn’t always limited to pizza. 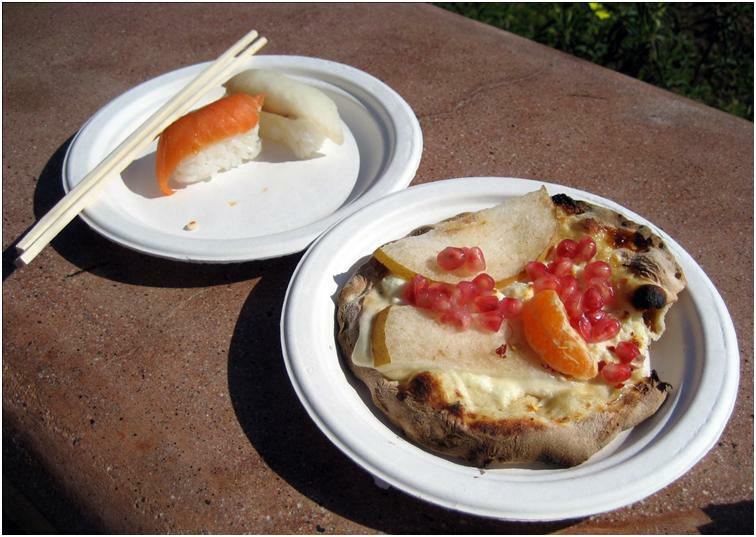 One of the best winery snacks I’ve had in recent memory was pomegranate pear mandarin pizza and sushi. You can’t get that kind of experience just anywhere. I’ve enjoyed the great wines, gourmet food and genuine hospitality at Soquel Vineyards many times and I’ve always had a great time. I highly recommend taking a trip up there. If you enjoy Pinot Noir, at some point you’ve probably encountered the word “clone”, as in “This wine is crafted from Djion clone 115”. A clone not actually the result of a test tube experiment, and it’s certainly not any kind of genetically modified organism, or GMO. Pinot clones are simply grape vines grown from cuttings of the best Pinot vines from renowned vineyards, or their descendents. Most clones grown in Oregon and California were cloned from French Burgundian stock. Many of the most common clones originated in Dijon, hence the term “Dijon Clone”. I’ve frequently written about the unique characteristics of single vineyard wines. Clones add another dimension to terroir, which is the concept that a wine’s flavor is influenced to a large degree by the place in which it is grown: soil, water, elevation, slope, and temperature all play a role. In the nature versus nurture debate, terroir is the nurture while the clone is the nature. Combinations of the two are nearly infinite, making for the abundant variety of flavors that are central to wine tasting adventures. Big vintners mix grapes of different vineyards and clones in giant vats, averaging out all the individual characteristics. Smaller, artisanal winemakers do a much better job of preserving the uniqueness of the grape, bringing the terroir and the clone to your palate. My friend Craig Handley of Pleasant Valley Vines is one of several winemakers who purchase special Pinot fruit from local grower Lester Family Vineyards. In 2008, Craig selected grapes from two blocks of the Lester Vineyard, one planted in Dijon 115 clones and the other utilizing 667’s. He fermented, barreled and bottled the clones separately, making two excellent wines with subtly different overtones. Another popular clone, and a favorite of mine, is 777, as witnessed by two single vineyard, single clone “triple sevens” I found in my cellar while “researching” this column. Heart O’ the Mountain is located in the Santa Cruz Mountains on the old Alfred Hitchcock Estate. Readers who know my love of wine and film should not be surprised if we return to Heart O’ the Mountain in a future column. Other popular clones are 114, 828, Pommard, Swan and Pisoni. The Pisoni clone was brought to the U.S. from a legendary French vineyard in a suitcase by Gary Pisoni of Garys’ vineyard fame, though there are rumors that he smuggled it in an undergarment. 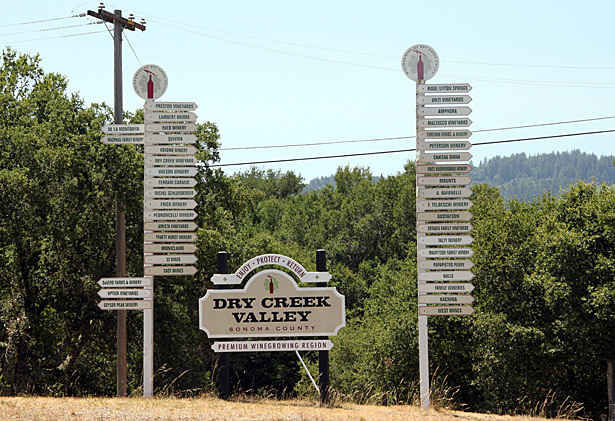 Gary’s Vineyard is planted in Pisoni and Swan clones; Swan is rumored to be another “suitcase clone”, but no one is certain how it came to be planted in Swan’s Russian River Valley vineyard. Joseph Swan did little to discourage rumors of his clone’s origin, adding to the mystique. The numbered Dijon clones aren’t surrounded by as much mystery as their suitcase travelling cousins, but they are widely planted and make excellent wine. Most of the numbered clones were developed at the University of Dijon by Dr. Raymond Bernard in the 1960’s, so all pinot lovers owe the good doctor a debt of gratitude. For those wondering about the origin or meaning of the numbers, they serve only to distinguish one clone from another. 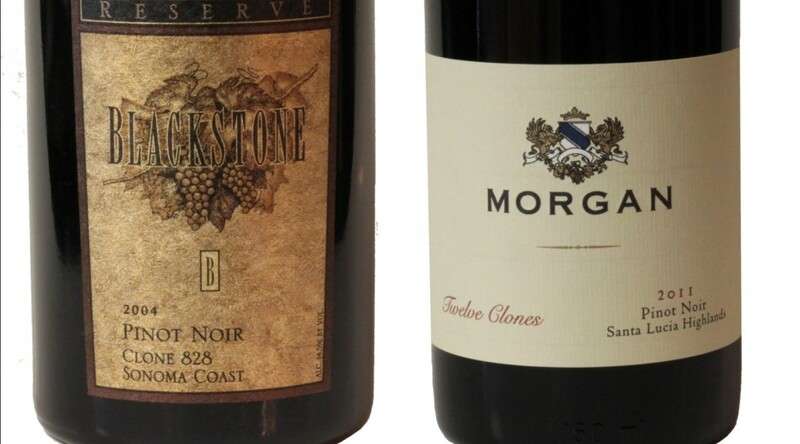 In honor of Dr. Bernard, we’ll close with label shots of a lovely Blackstone 828 from the Sonoma Coast, and one of my favorite clonal blends, the Morgan 12 Clones, sourced mainly from their Double L Vineyard in the Santa Lucia Highlands. 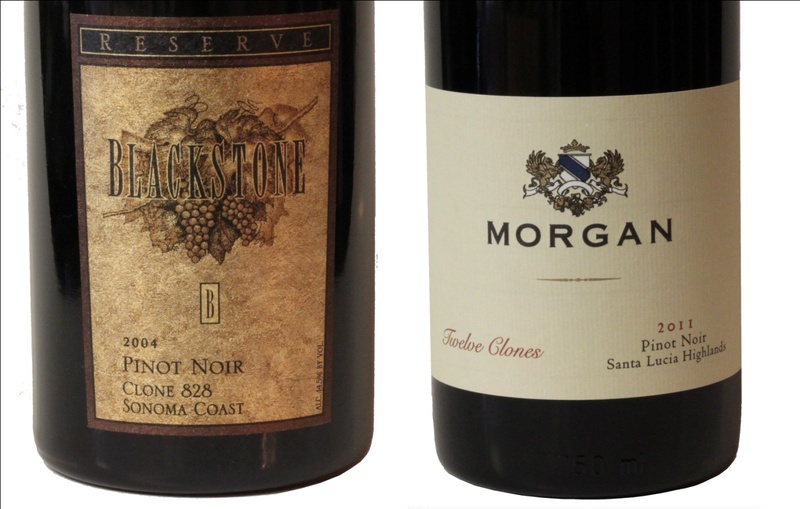 Of the thousands of wines tasted by Wine Spectator magazine in 2012, the Morgan 12 Clones was ranked in the top 100.